Sarkari Yojana » Central Government » Agricultural Mechanization Promotion Scheme for Crop Residue Management by Central Govt. 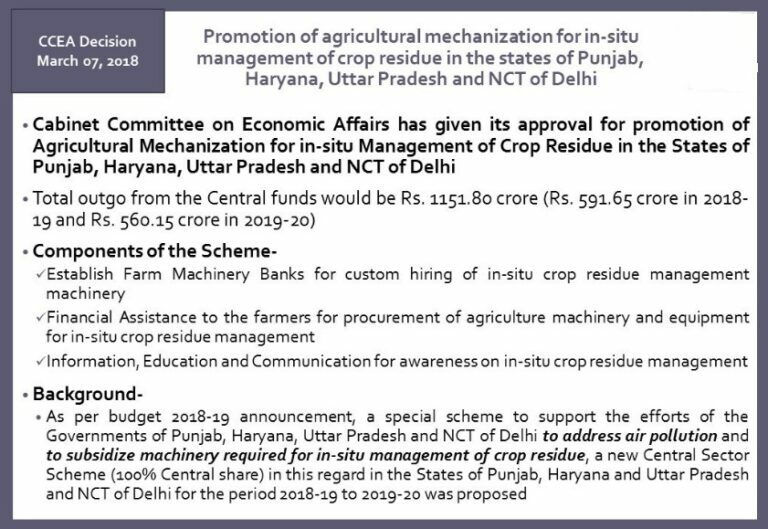 Agricultural Mechanization Promotion Scheme for Crop Residue Management by Central Govt. Cabinet Committee on Economic Affairs (CCEA) has approved Agricultural Mechanization Promotion for In-Situ Management of Crop Residue Scheme. Subsequently, Central government has approved this scheme to address the problem of Stubble Burning in the states of Punjab, Haryana, Uttar Pradesh and NCT of Delhi. For this Central Sector Scheme (100% central govt. share), govt. has allocated Rs. 1151.80 crore for period of FY 2018-19 and 2019-20. 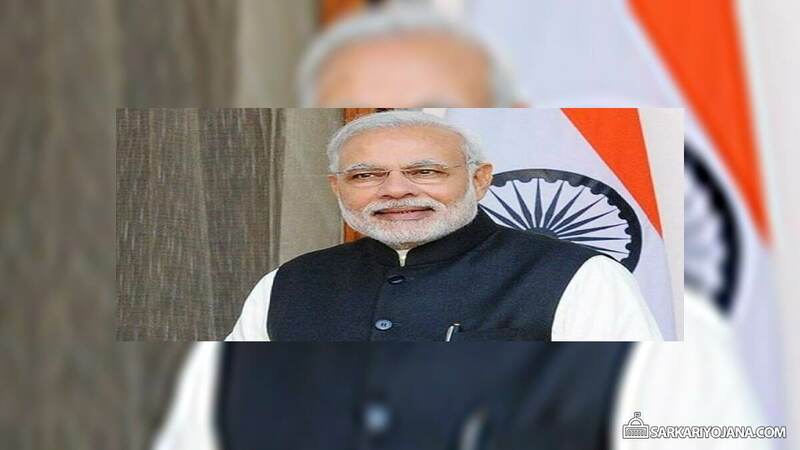 PM Narendra Modi has chaired this Cabinet Meeting and gives it nod to reduce air pollution. Under this PM Yojana, govt. will provide financial assistance to provide subsidized machinery to farmers. In addition to this, govt. will also establish various Farm Machinery banks and create mass awareness about the scheme through information, education and communication. Central govt. will establish various Farm Machinery Banks so that farmers can hire in-situ crop residue management machinery. Accordingly, govt. will provide this financial support to various farmers cooperative societies, FPOs, Self Help Groups (SHGs), Registered Farmers Societies / Farmers Group, Private Entrepreneurs and Group of Women Farmers. In this component, govt. will provide financial assistance of 80% of total project cost to the above mentioned beneficiaries. Thus this Agricultural Mechanization Promotion Scheme will address the issue of Stubble burning to a great extent. Central govt. will provide financial assistance to farmers for purchase of Agricultural Machinery and Equipment for crop residue management. Accordingly, govt. is going to provide financial assistance of 50% for machinery / equipment to individual farmers. Central govt. will provide financial support to State Government/ KVKs, ICAR Institutes, Central Government Institutes, PSUs. This will help in creating awareness and carry forward activities towards information, education and communication. Accordingly, govt. will organize several mass awareness campaigns through short and long films, documents, radio and TV programmes, advertisement in print media. Moreover, govt. will also conduct demonstration camps at various levels, capacity building programme, star campaigning, award for Village/ Gram Panchayat to achieve zero stubble burning. Central govt. will provide Rs. 1151.80 crore from Central Funds as govt’s share is 100%. Accordingly, central govt. will release Rs. 591.65 crore in 2018-19 and Rs. 560.15 crore in 2019-20. — District Level Executive Committee (DLEC) will identify beneficiaries and location specific agricultural equipments and notifies it to the state government. The state govt. will then select the beneficiaries to establish Farm Machinery Bank for hiring purpose. Moreover, the procurement of such machines will be done on individual ownership basis in order to ensure transparent and timely delivery. — For credit requirements, State Nodal Agency / DLEC can tie up with banks. Accordingly, govt. will document the name & other details (including Aadhaar / UID no.) of selected beneficiaries at district level. Finally, the central govt. will release the financial assistance through Direct Benefit Transfer (DBT). Department of Agriculture, Cooperation and Farmers Welfare (DAC & FW) will implement this scheme at Central level. National Steering Committee presided over by Secretary, DAC&FW will formulate and give instructions and guidelines. Moreover, this committee will also monitor and review its performance. Subsequently, an Executive committee chaired by Additional secretary will monitor its activities. At the State level, Department of Agriculture of the concerned State will implement this scheme. State Level Executive Committee (SLEC) will monitor implementation of this scheme in their State. SLEC will also provide regular inputs to Executive Committee for correct policy formulation. Moreover, SLEC shall ensure that no crop residue burning incident is taking place in the agricultural field. District Level Executive Committee will carry forward project formulation, implementation and monitoring in districts. DLEC will also consists of Surveillance Committees to ensure farmers are not performing stubble burning. In addition to this, DLEC will also involve various Panchayati Raj Institutions. DAC&FW has the responsibility to em-panel the manufacturer of machines and equipment along-with cost of machinery. In Union Budget 2018-19, Central govt. has announced to launch a special scheme to tackle air pollution in Punjab, Haryana, UP and Delhi. Accordingly, central govt. is now addressing this issue of stubble burning through subsidized machinery to farmers (either of their own or on hiring basis). Subsequently, Central govt has launched this Central Sector scheme for In-Situ management of Crop Residue for period of 2018-2020.